Every city seems to have fabulous little cafes, bars, and restaurants tucked into areas only locals seem to know how to find. Melbourne has no shortage of amazing secret laneway eateries. But often, it can be impossible to know where to start looking. Often, you can walk right past the entrance of these bars and cafes with little knowledge they even exist. But I braved the hustle and bustle of the CBD to find some of these amazing, hidden laneway gems. Spending the day sightseeing all around Melbourne? Are you hungry but not quite hungry enough for a full meal? Tired of being around heaps of people? MoVida is the place you've been searching for! Many people flock to Hosier Lane to see the incredible artwork, but it's quite easy to overlook the little cafes and eateries along this lane. MoVida offers a quiet sanctuary for a quick rest while allowing guests to view the incredible street art. While the menu can become quite expensive, one can quickly grab a few tapas and a glass of wine without spending heaps. This is the perfect retreat to recharge your batteries before taking on the rest of Melbourne’s CBD. Do not be fooled by the address; there is a hidden laneway cafe here. There are two entries to this cafe: one being on Bourke Street and the other on Meyers Place. The front section of the cafe tends to be where most enter and stay. But if you walk through a door and down a short narrow hallway, you'll find the secret garden. On most days, you'll be able to enter the garden via a small door on Meyers Place. This place is perfect if you want to feel secluded from the hustle and bustle of the busy CBD. Food is available in both the cafe and the gardens. Perfect for after work drinks or a quick drink when in the city, make sure this is a stop on any trip to the CBD. Hidden close to Parliament Station is this beautiful, rooftop bar. Be prepared to walk up a few flights of stairs to reach this bar. Trust me, the walk to the top is well worth it. This bar has fantastic decor, a great view of Parliament, and allows for some pretty amazing sunset views. Worried about freezing during the winter months? Don't! There are outdoor heating lamps to help keep you warm. This bar is ideal for after work drinks or anyone who enjoys photography. Loop Roof has an excellent selection of small share plates, perfect for after work drinks. If you're there during winter, try the astounding mulled wine and a glazed bourbon doughnut. I am a sucker for a good mulled wine. With the abundance of cafes in Melbourne, it can be quite challenging to figure out which ones to try. Hash has found a secret to get you interested in the cafe. Not only do they have amazing coffees, but they also have a speciality hot chocolate! This is no ordinary hot chocolate but a fairy floss hot chocolate! You heard correctly... Fairy Floss Hot Chocolate! Like something out of a science experiment, you're presented with a massive mound of fairy floss and your hot chocolate in a science beaker. From there, you get the enjoyment of pouring your hot chocolate over the fairy floss and watching the fairy floss disintegrate. It's perfect for little ones and adults. I will be 100% honest; I am not one for coffee. It has never been my thing. But I decided to give the ice coffee a go at hash. Holy heck was it delicious! I highly recommend it. This used to be a cute little New York inspired cafe down Hardware Lane. If you stumble down Hardware Lane, you will see Bowery to Williamsburg still rests tucked into the charming brick facade. But do not be fooled. It is not longer an American’s sanctuary; it is now Bowery to Williamsburg Tel Aviv. If you want an amazing bagel with schmear, you’ll need to travel to Oliver Lane. And now I want a pastrami sandwich. Excuse me while I go indulge. If you’ve ever been to Melbourne, what are some of your favourite hidden laneway bars and cafes? 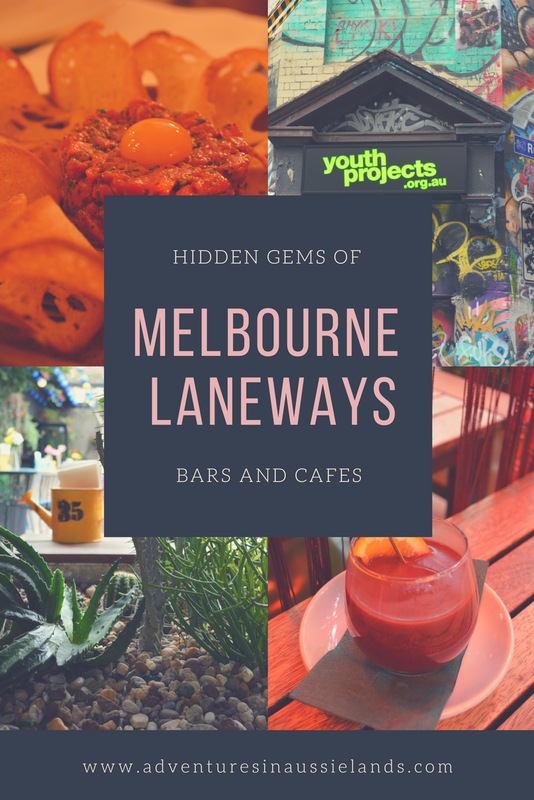 Do you have any favourite hidden bars and cafes in your hometown? Be sure to share them in the comments below! Not gonna lie, I totally love when you do the photo tours on your blog! They're awesome! You should definitely come visit Melbourne. So many amazing things to see and eat! I have never been to Melbourne before but I am definitely planning to go. I have some family there so I will keep this list for when I need it. Yes definitely do! I hope you make it out to Melbourne one day. It's pretty awesome (but I may be a bit biased). Melbourne is amazing! I will probably make this a series because there are so many amazing places in Melbourne. Apparently theres a bar that's hidden behind a book case! Lane's Edge sounds exactly like a place I would love! How amazing to eat in a secret garden! It's such a cool place. I'm very happy that I stumbled upon it! I've never been to Melbourne! I also only just recently found out how to pronounce Melbourne, haha. Right!?! People hear pronounce it differently to how people in the US do. It's so weird. I still haven't figured out why Melbourne is basically pronounced Mel-bin but Cranbourne is pronounced Cran-born. Makes no sense! I have heard that Eau De Vie is fantastic. I didn't bother going when I was in Melbourne last time cause I was pregnant. Have you been? Even though it has been more than a decade since I was in Melbourne, I still believe that if there is a city I would love to live in, it would be this. I loved the cultural aspect of the place and of course the food, especially in Chinatown, is just phenomenal. Thanks for the list and I shall look out for the places whenever I am there next.